Compass Pools $ Advices $ Which pool material is the best for you? If you took a guess that concrete pool is made of concrete, congratulations, you scored a point J Similarly to house constructing, building a concrete pool you need to make an excavation, build the foundation, a base plate of sufficient strength, and concrete block walls (so-called lost formwork). This concrete corpus needs to be finished with some sort of fine surface, usually ceramic tiles, glass mosaic tiles or pool liner “coating”. All adjustment works should be carried out by professionals. This ensures at least some guarantee of preventing eventual leaking as a result of poorly joined liners or tiles not sticked properly. Concrete pools offer one great advantage: absolute freedom of design. You can really think about anything. The only limitations are the skills of a person who will be supposed to build your concrete dream. And as it usually happens, the advantages are often counterbalanced by disadvantages. First, you will have to wait for a while before you can take a swim in your new concrete pool. 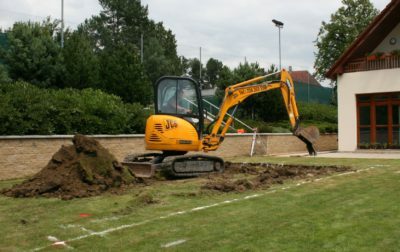 All construction works take their time… until the excavation is ready, until the base plate hardens, until the pool liner is sticked or walls tiled… If you have ever built anything, you are now probably nodding with understanding, if not, you should know that it will take ages. More specifically, weeks or even months. Tiles and mosaic suffers with the same weakness. Their joints are made of porous filler, which makes it perfect environment for dirt and various bugs – bacteria and algae. “But the mosaic so beautiful,” you might say. Yes, it is. Then it is a question of give and take and you will need to give your pool more intensive cleaning (add some more chemicals and one at a time grab a toothbrush and get to work). The pool liner is in constant danger of getting damaged. Ocassional scratch or small hole may be aesthetically displeasing, and even cause a water leakage. So-called vinyl liner pool is made of welded 0,5-0,8 cm thick polypropylene plates, stabilized by outer ribbing. Nevertheless, you´ll need a baseplate and concreting of the surrounding walls. Considering all pool types in our list, vinyl liner pool is the most affordable one, but often it is not so pleasing as the other types. If you have high aesthetic sense and stylish house, choose another alternative. A comprehensible comparison can be found in the table at the end of this article. So many titles and yet it is still the same. Understand it if you can! Common term is laminate, more precisely fiberglass pool – it´s made of resin and glass fiber mixture, optionally with other substances. 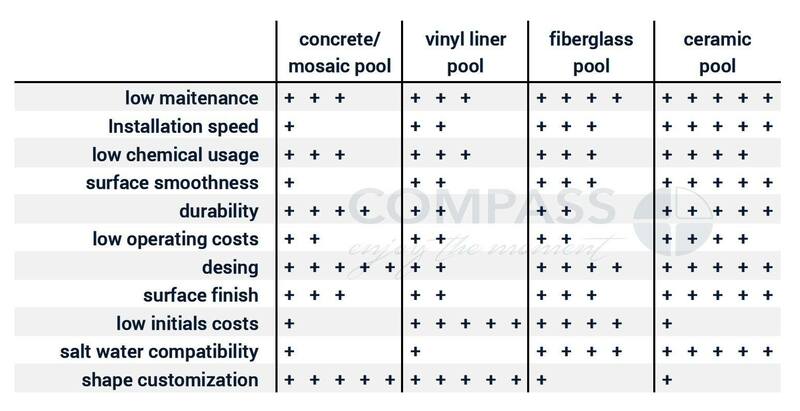 Sometimes it is called also composite swimming pool, shortly composite, which describes it as a mixture of several material types with different characteristics. One of them is solid, another elastic, and together they do a great job! Fiberglass pools are manufactured by application on the form – so-called shoe-tree. Each layer is painted, sprayed or simply layed on preformed shoe-tree and after the induration the pool comes out in required shape. Obviously, the shape range is limited by manufacturer´s supply. Any atypical customized shapes are not available, or more precisely – are not cost-effective, because a good-quality form is more expensive than the pool itself. Fiberglass pool installation doesn´t require bricked side walls. 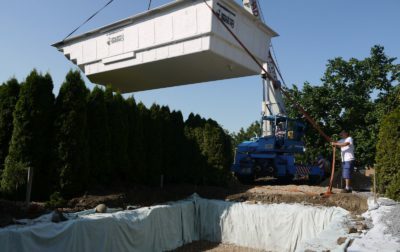 A base plate is built as a foundation, sides are simply backfilled by moistened concrete. During the filling it is essential to add water to the pool shell to balance the pressure on its walls. The water level has to be always higher than the added concrete material level. Color and surface range varies, depending on the manufacturer´s supply. Installation process doesn´t take long, the price is reasonable. 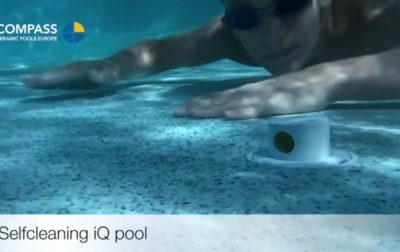 For more information see the Pool Characteristics Comparison table. What is it, then? It is again a composite pool, which means it´s structure is enriched by additional materials improving the quality and durability of the final product. This technology was developed in 1980´s in Australia. It was so good that it obtained a patent and ceramic pools are now manufactured also in Europe, in nearby Slovakia. Beside laminate layers it is composed of ceramic layer and carbon fiber mat. This changes an ordinary laminate into extraordinary stable and resistant material of long-term durability. Ceramic pool surface is the most beautiful thing which makes this pool beauty so pleasing. The reason is the upper layer, a mixture of color and glittering particles, which makes the pool water look fresh and sparkling. It is completely smooth on touch, nearly non porous, and this helps to keep dirt and microorganisms at bay. On the contrary, the steps and bottom are pleasantly roughened to avoid slipping. If you choose a ceramic pool, your model is currently in stock, you aren´t in a middle of busy pool season and are a good manager, your pool can be ready in a week. Yes, the installation is quick and doesn´t require a base plate and time-consuming construction works. The pool shell is placed into a gravel “bed” and backfilled by moistened concrete. Installation is finished by concrete ring… and now you can hop into the water, after all, it was really a busy week. You could inspire in our picture guide How to build the swimming pool STEP by STEP. If you have read this far, you may decided “which material”. Now you should answer the question “how is it supposed to look like”. At this point please let your wife to have her say – if she already hasn´t read over your shoulder. She can help you to choose the color and shape – or see the article How to choose your pool – witch is coming soon. The last important pool-choosing step is to pick up the right pool technology. Either the necessary one (filtration and disinfection) or the one allowing you to fully enjoy your pool (heating, roofing, self-cleaning, counter-flow etc.). If you need more information how to choose the pool technology tailored to your requirements please see the article Don’t be a slave to your pool.